Anyone who needs to regularly check the date, like receptionists or PAs, will enjoy using this personalised Calendarpod - Mini Size. 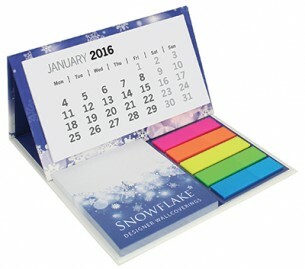 The standalone calendar presents one month to view, and below it also includes a pad containing 50 sheets of sticky notes as well as five coloured index tabs with 25 sticky notes in each. Perfect for anyone who is always planning events and meetings. This item is printed via digital or litho printing.